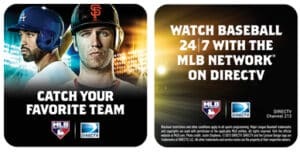 If you subscribed to MLB Extra Innings ® for your Bar or Restaurant, you should have received your DIRECTV MLB Extra Innings Promotional Kit by now. If for some reason you have not received your promotional kit, please contact Its All About Satellites if you are one of our bar or restaurant customers or contact your dealer of record if you are not. You also should have a credit on the DIRECTV MVP website that you can use to purchase additional branded items to help you promote MLB on DIRECTV and other sports that you have available. Other items that are available at heavily discounted prices as part of the DIRECTV MVP marketing program include Pitchers & Pint Glasses, Outdoor Sidewalk Talkers, Table Tent Holders, and much more. 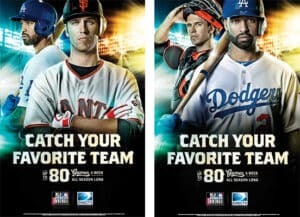 The MLB Extra Innings ® promo kits, which are part of the DIRECTV MVP Marketing program, are designed to help you drive traffic into your bar or restaurant for MLB R games. These promotional kits are FREE as part of the DIRECTV MVP for each of the major sports packages you order including MLB Extra Innings ®, NFL Sunday Ticket ®, NHL Center Ice ® and NBA League Pass ®. One of the great benefits of MLB Extra Innings ® is that you can promote events that are 7 days per week and at times that other sports are not on. MLB games can be promoted for business lunch specials and other daytime hours when NBA, NHL, and NFL games and other sports are not on TV. MLB Extra Innings & the DIRECTV MVP Marketing program help you to attract more customers not only for prime time, but all through the day and all through the week. If you have not yet ordered MLB Extra Innings ®, great pricing packages are still available including the exclusive 3-pay option from DIRECTV. Give your customers up to 80 games out of market games per week in crystal clear HD and become the home of your customers favorite team. 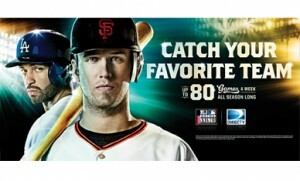 To order MLB Extra Innings™ for your Bar, Restaurant or home.